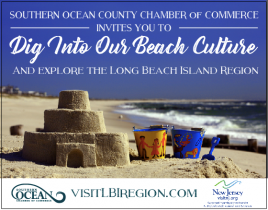 Southern Ocean County Chamber of Commerce invites you to celebrate the region's independent Beach Culture from June 30-July 7 as Summer 2018 begins with a bang! Redefine Beach Culture during a fabulous Fourth! SHIP BOTTOM, N.J. - June 11, 2018 - PRLog -- Summer 2018 starts now, so time to enjoy the beauty of the Jersey Shore. As families and friends gather for the summer holiday, there is plenty of options to assist in rounding out July 4 vacation and getaways. June 30- July 1 The Art & Sea Shell Festival from 10am to 4pm at Things A Drift 406 Long Beach Blvd, Ship Bottom. This new festival featuring art, jewelry, cards and original art is open all ages and levels of collectors.